This Autumn, young swimmers across the Borough will benefit from a fresh new getactiveabc Swim School programme thanks to a partnership with the STA (Swimming Teachers’ Association). 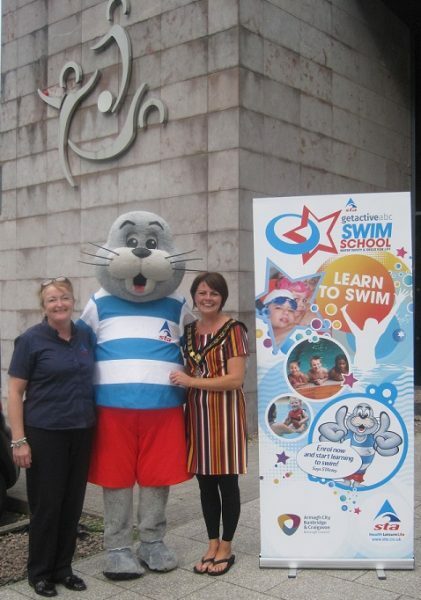 The new getactiveabc Swim School will be operate at the Orchard Leisure Centre, Banbridge Leisure Centre, Craigavon Leisure Centre, Waves Leisure Complex and Cascades Leisure Complex and aims to regenerate the current swim programme. With the introduction of the STA’s International Learn to Swim Programme (ILSP), young learners will be provided with a more exciting learn to swim programme that is supported with a range of badges and certificates. The new programme will have very little impact on children currently in swimming lessons. The main area of change will be the names of the swimming lessons from Stanley right through to Shark. A Progression Chart will be clearly displayed throughout the sites. The change will embrace all areas of the swim programme, ensuring a standardised programme is delivered to learners.